The recipe for this Biscoff Butter Cake is similar to my earlier post of Marble Butter Cake, just that I added an extra ingredient which is, crushed Biscoff cookies. Instead of mixing the crushed cookies into the batter, I just sprinkled them on top of the first layer of batter and then cover with the remaining batter. This cake is soft and moist with good texture ..... definitely a recipe for keeps! Line an 8 inch square pan with parchment paper, set aside. Crush the Biscoff cookies with a rolling pin, set aside. Beat the butter slightly, then add in the sugar and continue beating until creamy. Beat in eggs one at a time. Add in the vanilla. Sift in the flour alternatively with the milk. In another bowl, beat egg whites till foamy, then add in the sugar in 3 batches, continue beating till stiff peaks form, but not dry. 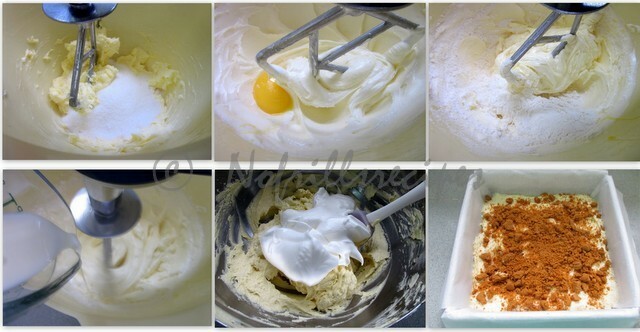 Fold in the egg whites in 3 batches, but do not overmix. Spoon half the batter into the prepared pan, then sprinkle on the crushed Biscoff cookies, top up with the remaining batter. Level the surface. Bake in a preheated oven @ 170 deg.C for about 45 mins. till golden brown. Test with a skewer till it comes out clean. Remove from the oven and let cool in the pan for 10 mins. before unmoulding and letting it cool on a wire rack to cool completely. mmm..that golden crust and tender crumb..totally irresistible! Happy New Year, Cheah. Happy New Year to you too, Angie! May I know how long do you the cake for? Thanks for asking. Have edited the post. Bake for about 45 mins.